Cupcakes, in my opinion, make a perfect treat. First, they're small and dainty, which lets you believe you're not eating too much, even if they generally come laden with frosting. Second, because they come in individually sized portions, they're so much easier to share with friends. Thus, when thinking of what to make for my colleagues at work this week, I settled on coconut flavoured cupcakes with a marshmallow pink frosting. The problem with cupcakes, however, is that they're a bit tricky to transport. If you live in the US, then you can easily get your hand on Oneida's cupcake carrier which not only makes it easy to transport 24 cupcakes without ruining their perfect frosting but the bottom layer of the carrier is also a muffin pan which you can use to bake directly in. Sadly, this nifty little gadget is not available in London although I have seen poor imitations in the market. Since I refuse to settle for anything but the best, I am to this day, cupcake carrier-less. Still, my cupcakes survived the extra-crowded tube journey to work with decidedly little damage and just like I thought, provided the perfect little pick-me-up for those universal Monday blues. Preheat oven to 170C. Line two 12-hole muffin tins with cupcake papers. Using an electric food processor, process the coconut until very fine - about 3 or 4 minutes. Add coconut to a bowl with sifted flour, salt and baking powder. Mix until evenly combined. In a separate bowl combine eggs and egg whites. Do not beat. In another bowl, cream the butter for 1-2 minutes. Add the castor sugar a third at a time, beating for 2 minutes after each addition. After the last addition, beat until the mixture is light and fluffy and the sugar has almost dissolved. Add the eggs a quarter at a time, beating for 1 minute after each addition or until the mixture is light and fluffy. Add the vanilla extract and beat until combined. Add a third of the flour mixture and beat on low speed until combined. Add half other coconut milk and beat until combined. Repeat this process. Add the remaining third of the flour mixture and beat until thoroughly combined; do not over-beat as this will toughen the mixture. Spoon mixture into cupcake papers, filling each about three-quarters full. Bake for 18 minutes or until a fine skewer inserted comes out clean. Remove cupcakes from the trays immediately and cool on a wire rack for 30 minutes before frosting. In a metal bowl combine the egg whites, sugar, corn syrup, cream of tartar and water. Place the bowl over a saucepan of simmering water (making sure the bottom of the bowl does not touch the water) and beat continuously with a hand-held electric mixer until the mixture is light and fluffy and forms soft peaks. Take the bowl off the heat and add the vanilla and a few drops of pink food colouring. Whisk the mixture until it forms stiff peaks. 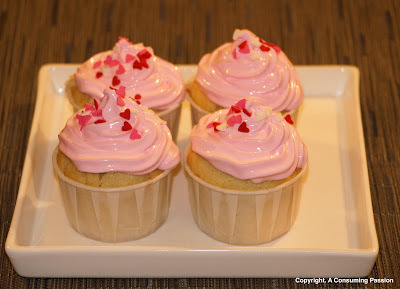 Pipe the frosting in a circular motion, starting around the edge of the cupcake, to form a soft-serve ice-cream effect. Top each cupcake with edible sprinkles. These are adorable!! 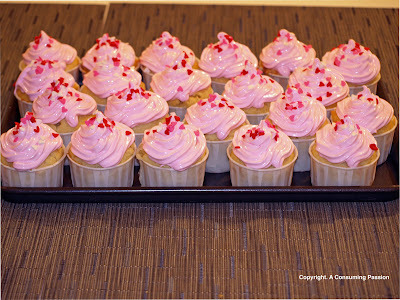 And I agree, cupcakes make the perfect little treat!